This story of the creation of Minegoo—Prince Edward Island—tells how the Great Spirit decides to do a thing. He creates the universe and the world, the sun, the moon and the stars. He creates a special helper, Kluskap, and then makes the Mi’kmaq people. After spotting a large clump of red clay, the Great Spirit makes a crescent form as a home for the Mi’kmaq people. This most beautiful place on Mother Earth is called Minegoo. The Great Spirit and Kluskap receive assistance from animals to find the best location for Minegoo. The people are woken to live on Minegoo and are given gifts. Kluskap rests on the shores of this peaceful island. Each page of the book includes the story in English and in Mi’kmaq. These pages are bordered by brightly coloured designs based on Mi’Kmaq quill patterns. Dodge illustrates the story with beautiful lightly painted watercolours. 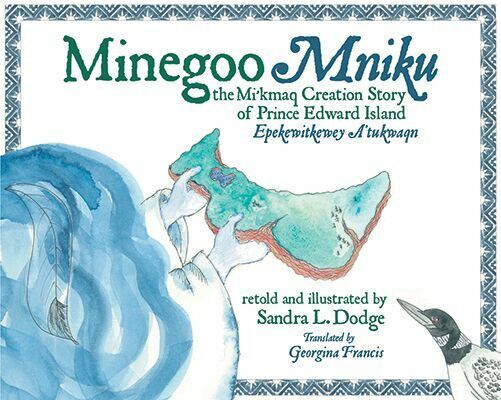 Classroom Connections: Minegoo Mniku is a wonderful resource to incorporate the Indigenous perspective and storytelling into learning about Prince Edward Island. Teaching that many of these stories have been handed down through generations gives students an understanding of how history is shared through oral storytelling. This book would be a great starting point for a legend writing unit in which students would write their own legends.